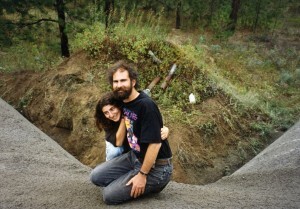 Here we are on month three of the story and year three of the actual building of our underground house. 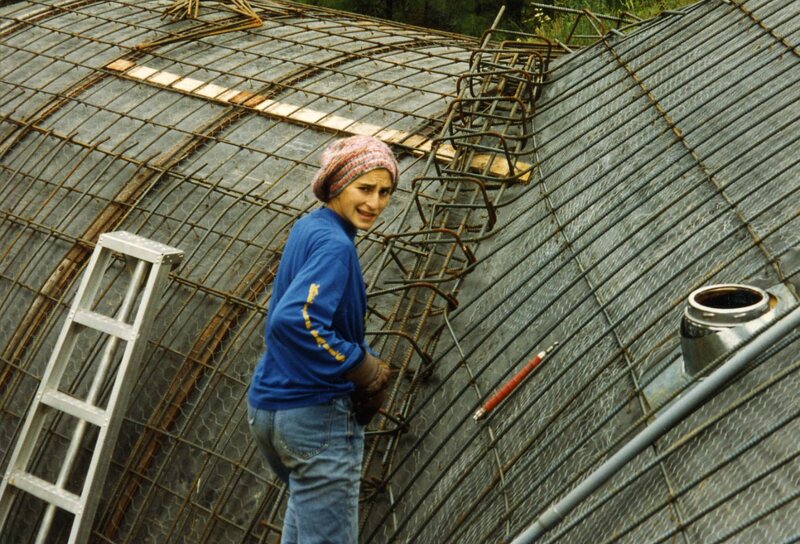 With the tile and rocks in place at the end of 1992, I needed to get the rebar skeleton in position for shooting the concrete onto the forms. A lot of decisions had already been made to get this far. Cheryl and I had looked at buildings near Coeur D’Alene made by shooting concrete onto inflatable forms. The result seemed too uneven for our purposes, but the way they accomplished it was to have woven chicken wire over the inflated forms and shoot a thin 1″ coating of concrete onto that. After letting it set up overnight, they could cover it with several inches of concrete and not have it collapse under the weight. Originally we were expecting to borrow some forms used on a couple of other similar structures. They had extensive trusses built into them to support the 76 tons of wet concrete we expected to use on the house. The crane truck used to move those forms however broke down and we were not able to get them. I wanted to have insulated forms so we could use the inside space over two winters while working on the outside. We could get by with these lighter forms by shooting one thin layer of concrete, letting it set up and then coming back with the full coat the next day. Bob Cunningham loves his work. Although my concrete guru, C.R. 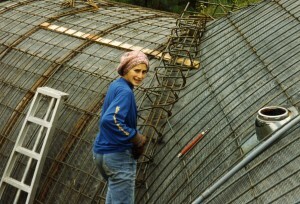 Conn, let me use engineering diagrams from Washington State University showing immense strength in 3″ of concrete over 18 foot diameter roman arches, the building department was not satisfied and wanted a signed engineered document for the whole house before they would grant a building permit. So I found a local engineer who would take on the project, Bob Cunningham. 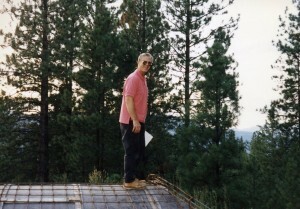 This was the early 1990’s and although Bob was a good engineer, he had never used a spreadsheet for mathematical calculations. We worked out an arrangement where he would come to the Assessor’s Office after hours (where I worked as a programmer) with his mathematical formulas. Together we put them into a spreadsheet. It worked great and we assembled some amazing graphs and tables. There was one hiccup. After doing all the calculations, Bob asked me where I thought it would break if it did. I thought that the joints between the central dome and the side arches could develop cracks if the support under the arches was uneven. I thought Bob would pencil in some extra pieces of rebar across those joints and be done with it. Well it ended up with a lot more than that. He specified bent rebar collars every foot or so with heavy rebar going through the collars and along the joint, the opposite direction from where I expected the stress to come from. It doubled the cost of the rebar and was in the plans before I could say anything else. Oh well. At least we got the permit. The design called for a double wall of rebar. This ended up being a lot of rebar, 3 miles worth. The steel truck that brought it up from Spokane could not turn around in our driveway. So he dumped it down at the bottom of the drive and left it there. Luckily, our neighbor, Clarence Tieszen, had a little Oliver tractor with tracks and a front end loader that he loved to use. He carried all that steel up to the house site for free. I was working 10 hour shifts 4 days a week at the office to have time to build the house the other 3 days at home. I dipped into the child labor pool again and soon Bina and April were cutting and bending rebar with an acetylin torch and tying wire with a twisting tool. I hired some friends and neighbors too, when they could get away. After a long summer of cutting, bending and tying rebar, we were ready for the concrete shoot. There are two approaches to this job, gunite and shotcrete. Gunite is made with dry ingredients with water added at the nozzle. It is strong with very little waste but the materials need to be stored on site. 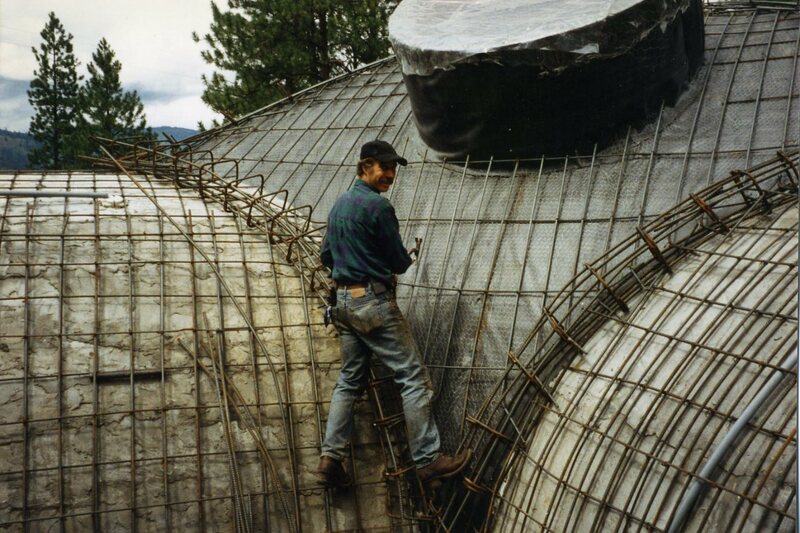 We opted to use shotcrete. A series of concrete trucks bring in the wet mix. 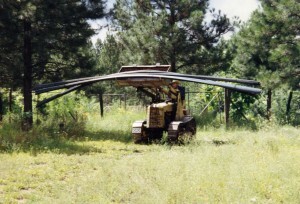 It is pumped through big hoses and compressed air is added at the nozzle to spray it on the structure. It takes special equipment, a big crew, custom concrete and coordination to make it all work. Throw in a bunch of curious family and neighbors and you have a really big show on your hands. Finally that day came, or rather, those two days came. 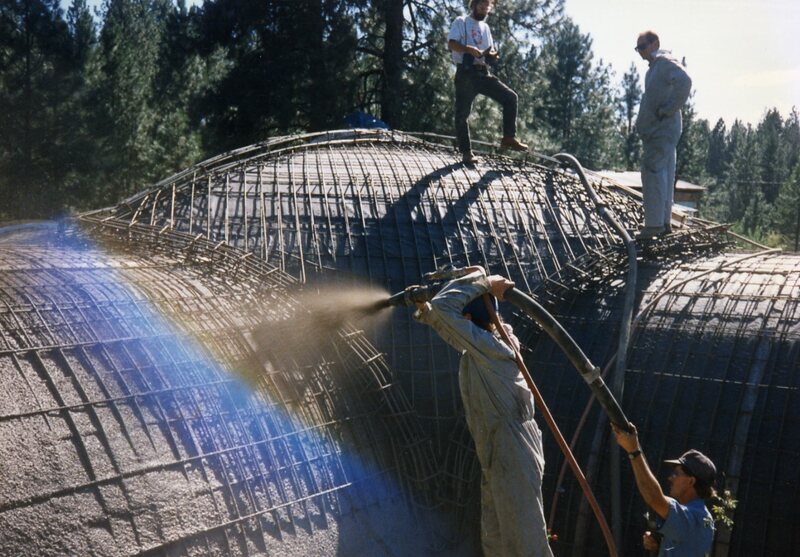 When the show was over, we had a really big hollow lump of concrete to live in. It had to cure for 90 days before we could bury it. But that doesn’t mean we couldn’t climb all over it and revel in the knowledge that it would be there for a really loooong loooong time.